I was standing in my closet the other day, contemplating how badly it needs to be cleaned out. Standing there and thinking wasn’t as productive as actually cleaning it out, but —to be honest— I still felt like I accomplished something. Standing there, I came face to face with reality. My closet is crowded with stuff I don’t need. There are a lot of clothes in there I don’t like and won’t ever wear again. In fact, some of the clothes never suited me. And, yet, there they hang, taking up valuable space. It’s not just my closet that needs a good spring cleaning. Sometimes my attitude gets just as cluttered. When I find myself complaining about every option or mentally ending every sentence with #FirstWorldProblems, I know it’s time to spring clean my attitude. In case you, too, have #FirstWorldProblems, and might find it helpful, here are three ways I’m trying to clean out my own cluttered attitude this spring. 1. Let go of last season’s duds. Sometimes I get emotionally stuck in the dreariness of winter, unable to let life blossom into spring. In other words, there are pieces of a past season cluttering up my emotions. Winter is over, but I’m still holding on to it. Some of the ideas I hold on to never suited me, and yet there they hang, taking up valuable emotional space. It’s like holding on to the outfit that looked amazing in the catalog but awful on me. I need to get rid of the outfit just like I need to let go of the junk from the past. I know once it’s gone I probably won’t even miss it, but it can still be hard to part with. 2. Find something beautiful that is worth keeping. Amid the clutter of my closet, there are a few pieces of beautiful clothing. Beautifully woven or decorated, yes, but also pieces that are beautifully flattering, or comfortable, or capture a special memory. The amazing thing about beauty isn’t really in the aesthetics. The power of seeing something beautiful is that it reminds me there is a God and it’s not me. Usually this doesn’t happen in my closet. It works best in my backyard. We live in a neighborhood, but the back of our property is sometimes a field and sometimes a pond. Whether it’s wet or dry, it’s full of life. From buzzing bugs and busy birds to wild deer that stand majestically alert when they sense my presence, the property is always beautiful to me. Seeing the beauty of creation and remembering my place as a child of God frees me from trying to be God. It has a way of spring cleaning away my urge to control and maneuver. It releases me from unnecessary worry and helps me enjoy this season (whatever season it is!). Another step I use to spring clean my attitude is to accomplish something. For me, it doesn’t matter how big the “something” is. Instead of a ginormous goal that will only further clutter my attitude, I set tiny goals that will give me the thrill of accomplishment. Allow me to use an example of a never-ending task in my life: The Laundry. Today I will wash, dry, fold, and put-away every piece of dirty clothing along with the sheets off of every bed. Today I will sort the laundry. Maybe you aren’t in charge of laundry in your house (or maybe you’re one of those weirdos who loves laundry), but I hope you see the point. Having big goals is awesome, but sometimes they take up so much space in our emotional closet we can’t hang anything else in there. Today I will conceptualize and write a book that will change millions of lives. In my spare time I will design the cover and a new font to debut with the book. Today I will read a chapter (or a page!) in a book and see how it changes me. 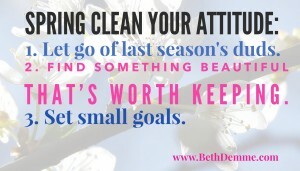 Part of de-cluttering my attitude is remembering that a small goal isn’t a bad goal. Having a closet full of stuff I don’t need means I can’t add anything new to it — there’s just no room. The same thing happens in my life. When my attitude is cluttered by past seasons or ideas that never served me well, there’s no room for the goodness of today. I want to make room for that goodness and that means de-cluttering my … self. What about you? Is your closet over-stuffed? Are YOU emotionally over-stuffed? Tell me about it in the Comments, on Twitter, on Facebook, or in an e-mail.